This category covers the important signals for stopping, turning, and backup. It covers “Front Park/Turn”, “Side turn”, "Auxiliary turn", “Back up”, and the biggest group at the rear of the vehicle, “Stop Tail Turn”. You can search at the right for a specific part or read below about you alternatives. Grote G4002 4" round red Hi Count LED lamp with female "pins" (connector) for easy upgrade from an incandescent lamp. It is the biggest selling brake light at Plaza. In stock are flush mounted round, oval, and rectangular lamps, box lamps, 2-stud round lamps, and double-faced lamps. Along with the lamps are the necessary mounting accessories, pigtails, and replacement lenses. You will still find bulb replaceable lamps, as well as the predominant sealed lamps that have proven more resistant to the elements. The most popular 4” round brake light at Plaza is the Grote Hi Count G4002 with its sparkling 24 diode display. It is also a female lamp with a standard connection that makes it compatible with many male pigtail plugs and an easy upgrade from incandescent. Like many things in life it is popular for being easy and pretty. A strong competitor is Truck-lite’s LED Super 44 series, 44302R, a male lamp that requires the Truck-lite Fit n Forget female pigtail plug. A pigtail adapter is available that allows the lamp to be connected to standard PL3 plugs. This lamp’s hard shell lens is a plus. A less expensive 4” LED lamp is the popular Grote Select 54342 which is another female lamp that makes it easy to upgrade from incandescent. It just does not have the sparkle of the Grote Hi Count. In fact, it looks so little like an LED lamp, that it is not often stolen off a vehicle - a common problem with LED lamps. At Plaza the top-of-the-line 4” round LED lamp is the Grote Supernova 53252 with 10 diodes. More importantly, it is solidly built for circuit board protection and uses a male pin connection to double-seal female plugs. In spite of costing more than four times the least expensive Grote Economy incandescent, the Supernova 53252 is a good seller with those who understand the value of brake lights that may never need maintenance. Finally, the incandescent Grote Torsion Mount 52772 is the second most popular 4” brake light because it seems to represent a middle ground - sharing with the LED’s a resistance to damage from vibration but at a lower cost. This lamp along with the Grote Economy uses a female connector with a locking tab that is compatible with the standard PL3 plugs used by competitors. All of these 4" lamps are sealed and the incandescent bulbs are not replaceable. This means that the longest life lamp is going to be the best built LED (and that is the Supernova). It has the least risk of failing while on the road and demands the least of your high-priced mechanic's time. See our entire stock of 4" round stop tail turn lights at this link. A Hi Count lamp is again the biggest seller in this category. The G6002 is a female lamp compatible with the many standard male pigtails of current incandescent lamps. And it has a 56 diode display. 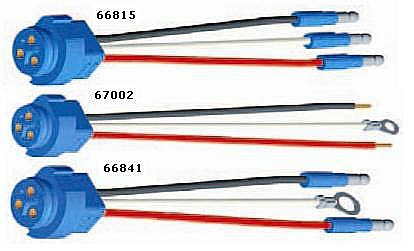 The Truck-lite 60250R is an advanced male pin lamp using Fit n Forget female pigtails and has 26 diodes but is somewhat more costly. A popular low cost lamp in this size is the incandescent Grote Torsion Mount 52892 which, like the Hi Count, is a female lamp compatible with the standard PL3 male plugs of incandescent lamps. “Box lamp” is the short name for a multi-function lamp that only faces the rear and performs the regular stop, tail, and turn functions but also does the job of the back-up, license lamps and reflector. To do all this it may need more wires than the standard 3-wire pigtail and can come in both right-hand and left-hand versions since the license lamp is necessary only on the side where the license plate is mounted. Box lamps are usually found on trucks where the original equipment is identified with an OEM part number. Incandescent box lamps are still big sellers at Plaza and they all offer replaceable bulbs. Plaza offers a variety of box lamps with unique connection requirements as shown on the right. 4 screw posts connector with universal application: Grote 52902 & 52912. This is a Torsion Mount design, Grote’s best incandescent lamp. 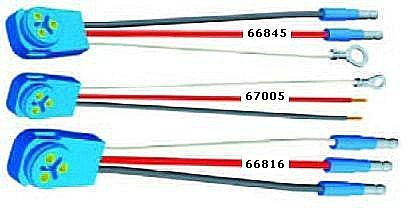 Attached bare-wire pigtail: Grote incandescent 50972 fits Peterbilt, GM, Jeep. Bare-wire pigtail LED: Grote LED’s G5202 & G5212 uses one of the 3 mounting studs for ground. The Hi Count design G5212 has 16 stop/tail/turn diodes, 22 back-up diodes, 4 license lamp diodes, and 2 side marker diodes. The Grote Hi Count double faced lamp G5530 is useable only on the left (driver side) of vehicle. For the right use G5540. Grote double faced lamps are the big sellers in the “other” category. They are used in the front of a vehicle where the yellow face is for the front turn signal and the red face is a brake light at least partially visible from the rear. For the double faced lamps in stock and other sizes not described above check our link here. The Grote Hi Count LED G5530 and G5540 are popular left hand and right hand versions with a marker lamp on the outside. Included are two studs for mounting, an attached 3-wire pigtail, a rear facing reflector, a 2 diode side marker, and 25 diodes for the red and yellow faces. Grote’s double faced incandescent 55340 is useable on either the left or right because the side marker lens is switchable. Included are two studs, rear reflector, 73” attached 3-wire pigtail, and replaceable bulbs. 3-wire male plug used on 67000 66812 66825 pigtails required for the many Hi Count LED and incandescent Torsion Mount Stop-Tail-Turn lamps with female connectors. Truck-lite pigtail 94707 is a "Fit 'N Forget" female plug required by most Truck-lite LED Stop-Tail-Turn lamps such as the Super 44 and Series 60. It is important to note that turn lamps have different safety requirements depending on how and where they are used. Front Park/Turn lamps seem to be similar to yellow Stop Tail Turn lamps but in the front of the vehicle these lights must be yellow in color and somewhat brighter. A side turn lamp cannot be flush mounted and must stick out to be visible from the rear. An auxiliary turn lamp is one that does not meet the requirements of the primary front or rear turn turn lamps but is used in addition to the primary turn lamp in order to increase the impact of the primary lamp. It may help to remember that you can use a front turn lamp in the rear of the vehicle but not the reverse. Side turn lamps appear similar in size and color to oval front turn lamps but the side turn lens must protrude from the trailer body in order to be seen from all angles. The three usual options for attaching a plug to the wiring harness are shown at the right for a Grote double seal plug. The ring is used for grounding to a chassis otherwise you use a male bullet to ground the light through the harness. Male bullets are used to attach to a UBS harness having female connectors otherwise you must splice a cut wire. Show also are the two options for attaching the plug to the lamp. In the first case the plug and wires protrude STRAIGHT from the back of the lamp. In the 2nd example the wires protrude to the side at a RIGHT ANGLE to the lamp. Grote and Truck-lite take different approaches to the design of the pigtail plug with Truck-lite taking advantage of the fact that LED's need less metal to conduct current due to their low power draw. Therefore the pins on the "Fit n Forget" plug can be small. Grote emphasizes the value of the seal between the lamp and the pigtail and has not reduced the size of the plug even for LED lamps. Male Pin or Female Pin? In the truck light business "female pin" is slang for the hole into which the male pin fits. For various reasons lamps have either male or female connectors. If you don't replace your lamp with a connection that is compatible with your existing pigtail, then you will be replacing your existing pigtail as well. Grote's advanced Supernova series offers male pins and many ways to connect to a wiring harness. In addition to the Grote 3-wire molded female plugs shown here the 4 inch round lamp can be used with AMP "hardshell" connectors or as a single function tail light with 2-wire plugs.